Hydrochemical investigation was undertaken in the Kadava river basin to ascertain the groundwater quality and its suitability for drinking and irrigation purposes. In this context, forty (40) representative groundwater samples were collected from different dug/bore wells based on their importance in drinking and analyzed. 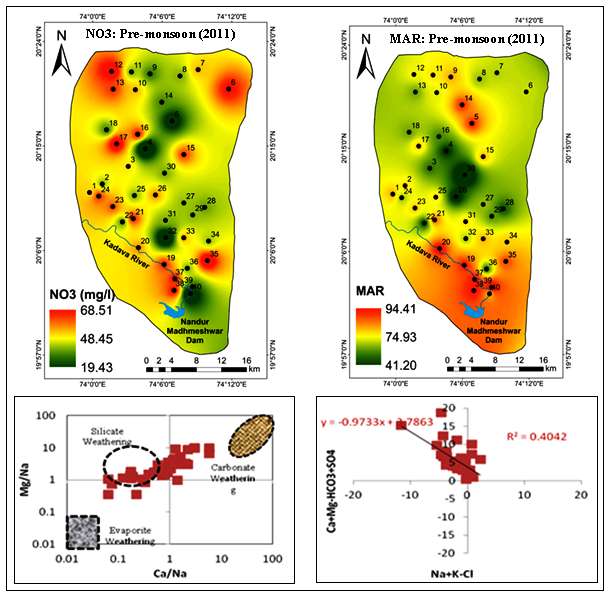 Physicochemical parameters like pH, EC and TDS; cations viz., Ca, Mg, Na and K; and anions include CO3, HCO3, SO4, NO3, F, Cl were determined to authenticate the groundwater suitability for drinking. According to BIS, pH (15%), TDS (27.5%), TH (27.5%), Mg (45%), Na (15%), Cl (2.5%), NO3 (52.5%) and F (2.5%) samples exceed the permissible limit (PL); hence, unfit for drinking. The positive loading of TDS and TH is influenced by the content of Mg, Na, Cl and SO4 ions. The increased concentration of Na over Ca corresponds to the ion exchange process. The irrigation indices like SAR, Na (%), RSC, MAR, KR and SSP were considered to evaluate groundwater aptness for irrigation. According to SAR and RSC classification all groundwater samples are suitable for irrigation. MAR ratio suggests 97.5% samples are unfit for irrigation. The study advocates that, those aquifers which are awkward then particular remedial measures required prior to their beneficial use. Hydro-chemical investigation coupled with groundwater suitability for drinking and irrigation was ascertained in the Kadava river basin. BIS drinking standards revels that, pH, TDS, TH, Mg, Na, Cl, NO3 and F surpass the permissible limit. The geogenic processes and anthropogenic inputs are the dominant factors influencing groundwater quality. SAR and RSC classification indicate that all groundwater samples are suitable for irrigation. MAR and SSP ratio exhibits that most of the samples are unfit for irrigation. The outcomes of the study may help to develop compressive groundwater management plans to improve groundwater quality in semi-arid region of basaltic terrain.